read this article guys!!! very important read! this article states that blue velvets originate from carbon rilli. Therefore in conclusion. everyone in australia has BLUE RILLI. 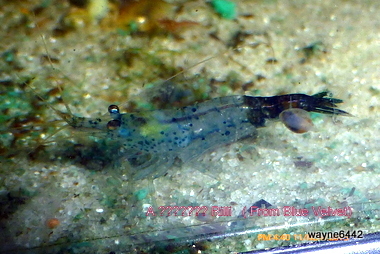 the shrimp i have been line breeding is not a new shrimp and is in fact a blue velvet. so how do you tell if you have blue rilli or velvet? simple. 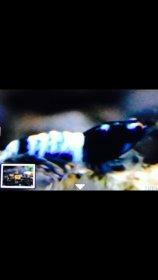 I'd still stand that the associated use of "rilli", is the distinctive pattern of coloured head & tail with clear body. 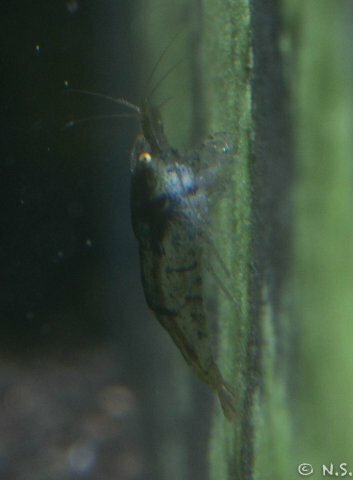 Theres been several claims, and confusion with shrimps over the past few years, and I must admit that I haven't read/research on cherries that much. 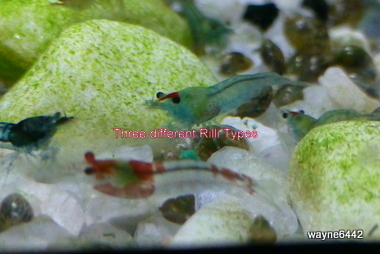 There's also a taiwan breeder claim these these are super blue blue rillis. Although the blue is amazing, they're still culls from a rilli perspective. IMHO, I've noticed that a lot of commercial breeders are also "re-branding/naming" their shrimps for the sake of sales, and "creating, a"New" line, when in fact they're cull's or not quite there in terms of the selective breeding project, i.e. the above. Just my opinion, but personally, a rilli has a distinctive pattern. 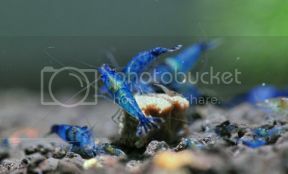 I came across another name that I queried yesterday called Blue Angel Shrimp. 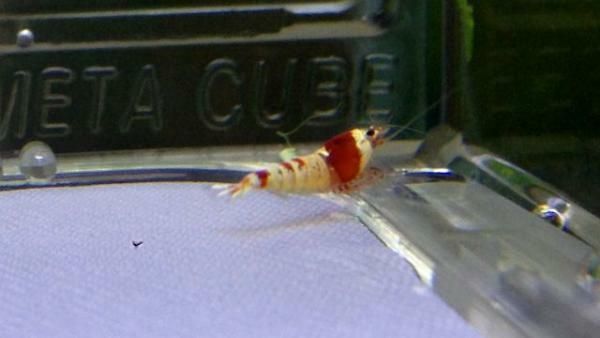 KiwibigD has named some as that from a line he has been breeding - they are cherry shrimp too. 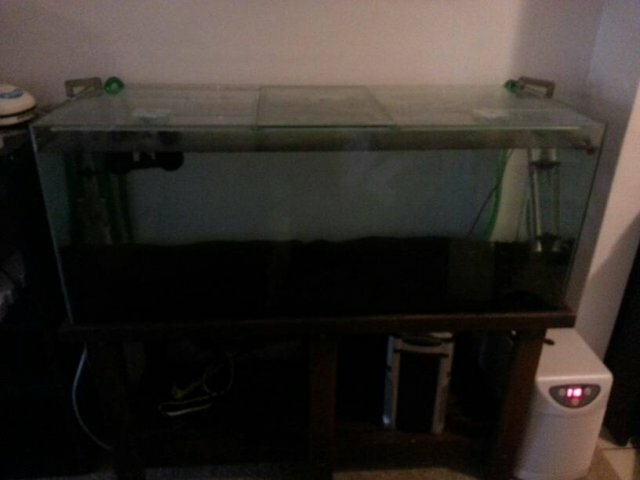 I didn't see a picture but hopefully if you read this BigD can you put up a picture? Also now the Blue shrimp from Chocolate where do they fit in??? 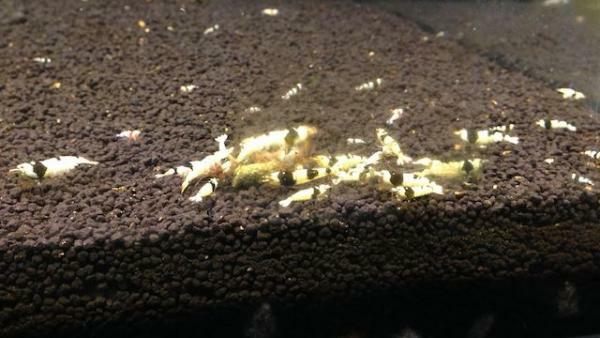 Never mind a newbie getting confused , so are they all just Blue shrimp????.?. I'm all for exploring different colours & trying to get the best out of them but it's the FIFO sellers that give something a pretty name just to sell it as something different that worry me. This happens a lot in the betta trade & some breeders will throw two random fish together & give it a name like "Purple Sunset Dream" when really it's just a purple & orange bicolour halfmoon that's got a slightly darker purple or lighter orange because of the cross the did. Can get very confusing for a lot of people. Time for a family tree starting from the Wild Type Cherry, and expanding on all the throw offs? This is gonna take me a very long time to post lol. I agree with John!!! And we should definitely make a sticky about cherry types and names. Personally with the blue rilli name I am in complete agreement with bb. It should just be called a light blue cherry or whoever created it first. i just call it blue rilli cause everyone does....following people jump off the bridge so to speak lol but hey! we should change that right? 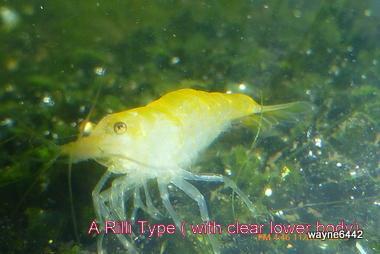 With the term rilli however I believe the definition is just a shrimp with translucent body areas? While I too think the best rilli is head and tail. I don't see others as a cull but that's in the eye of the beholder. Why not make it simple? Such as adding a specific trait of the rilli you are selling? A cull is only perceived as a cull if it does not meet the breeders requirements. For instance, I would one day love to breed a rilli with only tiger patterns. To me it's not a cull... To some yes. Arrrgggghhhhh so many discussions to follow! But I say male everything black and white. As for the Bloody Mary...... Looking from the photoI actually see it as another grade. 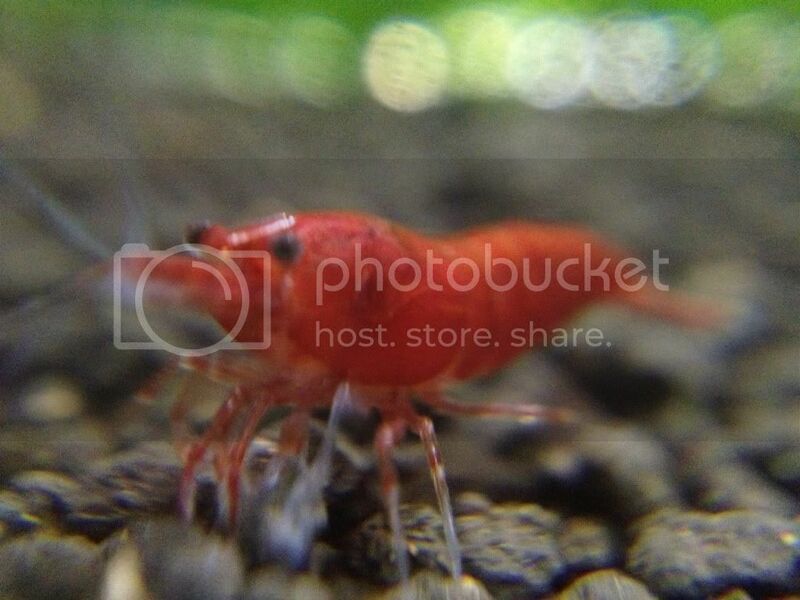 Translucent red. But it doesn't mean I think it should be its own name. It should just be a translucent red grading cherry. Some peole like the translucent quality, some like it painted! but I sure as hell don't want to buy a cherry that is translucent when I'm looking for painted fire qualities so yes I would at least like to know that it's a translucent red. Hence a grading but not a name. Get it? On another note, carbon rilli? Why not just call it a navy blue rilli?!? And with the carribean blue..... Why not just call it light blue body carbon rilli? It's no fancy name but you at least know what is goin on? Who you calling a crazy person? Ya crazy person! What Who me I didn't call anyone crazy. What you talking about. That was an anonymous person who infiltrated my post. A new variant/name should/can be assigned to a proven colony, showing them breeding true for 2-3 generations (?)... 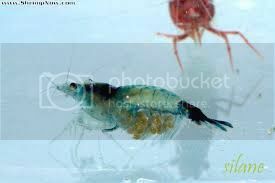 And not just 1-2 shrimps..... Breeders that have created the spotted head pinto for example, have spent years of careful selective breeding, and produce absolutely HIGH quality shrimps, so to say we've created a new variant based on 1-2 shrimps etc.... Is showing very little regard to the breeders who are dedicated to creating absolute quality shrimps. but is it a cull to be disposed out of my program ? No (sorry, no 1st dibs ..LOL), as I would love to extract the blue to my existing colony. If I do happen to achieve it, and my colony has the perfect rilli pattern with this intensity of blue, and breeding true, will I then call it a new variant .... I wouldn't, as it's still a red rilli blue body, but one with an insane blue...similar to Benibachi PRL....etc they're all still PRL, BUT line bred to produce the quality the breeder aims for.. I think it is important for all who are selling "Blue Cherries" to acknowledge and state the parental genetics. i.e. (from red rilli), (from carbon rilli), (from chocolate cherry), (from black cherry).etc That way the buyer knows what they are getting. Most of the blues advertised on this forum have had this kind of identification. It's buyer beware unfortunately but the buyer has the right to ask lots of questions prior to purchase. This is important and something I have sometimes neglected to do in the past but urge all newcomers to investigate if they are planning breeding programs. 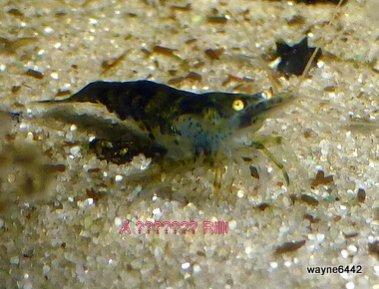 with the aid of a small amount of research I have discovered that the term Rili is used to describe a shrimp of the species Neocaridina Davidi ( Heteropoda) that exhibits a COMPLETE LOSS of colour on its body with various intensified coloured areas on the rest. 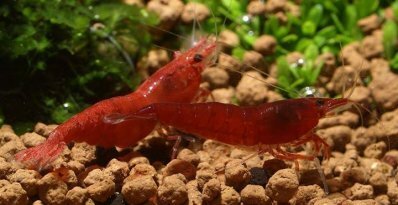 The strain was developed In Taiwan by a breeder in 2010 and the major aim was to develop a shrimp with CRYSTAL CLEAR parts without spots or COLOUR and intensify the other colour (eg the red on red rili's). 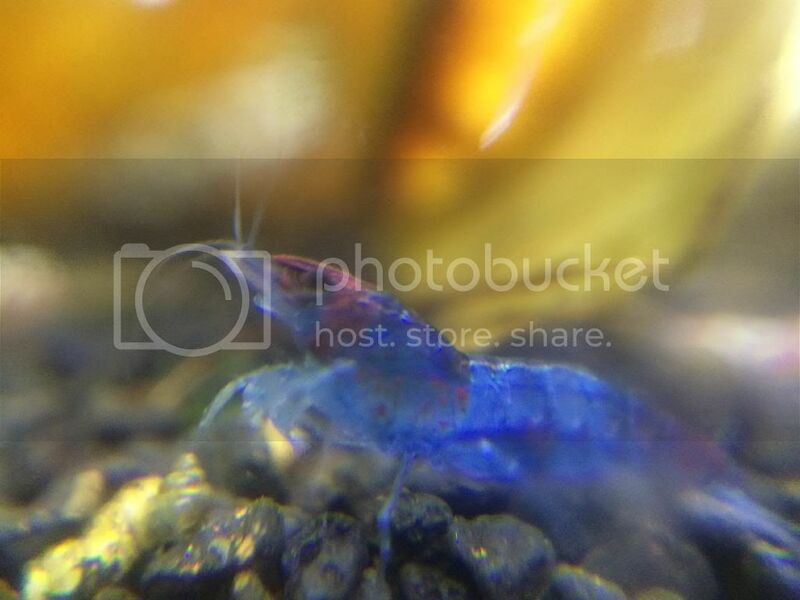 That kind of leaves us between a rock and a hard place as the various coloured Neocaridina davidi that some of us have been working on cannot be called a Rili as they don't show Crystal Clear body parts and carry a colour instead( that's the hard place!) A lot of us refer to them as Rili types (right or wrong?) prefaced by the major colour hue. 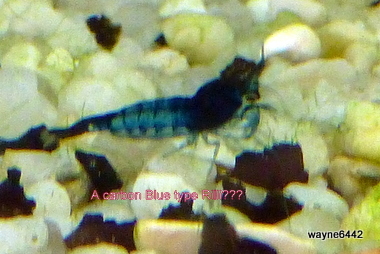 So a blue Velvet with a little red could be called a blue velvet Rili TYPE and not a blue Velvet Rili as there is no crystal clear body parts, "Now it's confusing"
I have seen mentioned on some o/s forums people selling blue velvet coloured shrimp with some (usually red)colours on them as Blue Velvet Rili's and I have also seen some carbon blue's with light and dark blue markings sold as Carbon Blue Rili's . This looks to be an acceptable practice overseas. Personally I think that these beautiful colour variations of the humble Neocardina Davidi deserve a name and a place in the cherry shrimp history just like yellows, blacks & reds after all they have all stemmed from the one wild shrimp, just like all of the other types like crystals etc. 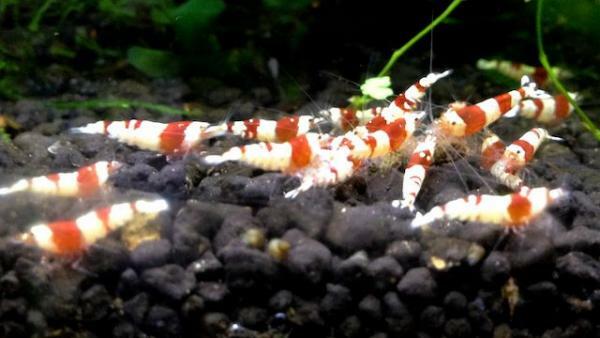 To me a shrimp cull is only perceived to be just that by a breeder who is after a certain trait and may not be considered as a cull by a person who is willing to put in the hard yards to develop another strain from the same shrimp. 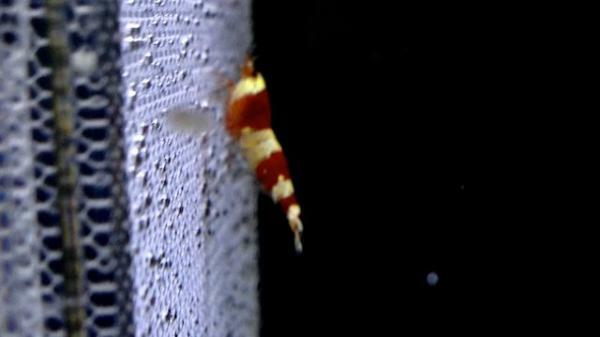 Their work should be acknowledged by being allowed to name a shrimp variation whatever is fitting. 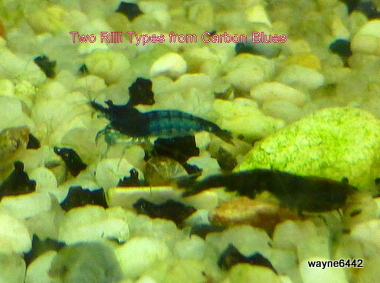 As BB said if a shrimp variation breeds true after three or four generations then it should be able to be described as such.